Ad Hoc Committee – Was organized to handle church matters that do not fall under other categories. Brotherhood – Is a collective representation of all men of the church (18 yrs or older), whose duty it is to provide service to the church and be a role model for young men of the church and community. Christian Education – Is made up of Greater St. Mark Church School teachers, Bible Study teachers, and BTU teachers and trainers. Counseling Ministry – Was organized to provide counseling to Greater St. Mark members or worshipers with a need. Courtesy Guild – Was organized to provide for the needs of church visitors and special guests. This includes welcoming them to the facility, providing programs, or other helpful literature, organizing tours of the City or Campus, and providing them with a nutritious meal. Crusaders – Was organized to provide guidance and training to young men of the church in the way of Christian living. Deaconess – This group of women serve along-side the deacons in visiting the sick and shut-in, preparing for The Lord's Supper, prepping candidates for baptism, and carrying out projects as assigned by the Pastor. Deacons – Duties of a deacon include assisting the pastor with distributing the Lord’s Supper, visiting the sick, and assisting with church activities, among other duties as assigned by the pastor. Disabilities Support – Was organized to assist St. Mark members and worshipers with special needs that may impede their worship or service. Finance Committee/Trustees – Handles the financial operations of the church, and the general maintenance and well-being of the church facility. Friendship Evangelism – Was organized to spread Christianity throughout the community. Girl Scouts – The St. Mark Girl Scouts is a member of the Concharty Counsel, which provide activities and life skills training to girls in different age groups: Daisies (age 5-6), Brownies (age 6-8), Juniors (age 8-11), Cadettes (age 12-14), and Seniors (age 15-17). Golden Life Center – Is a daily interaction program for Senior Citizens, which provides them the opportunity of interaction, exercise, medical advice, field trips, and the benefits of a hot meal. Grief/After-Care Ministry - Was organized to assist and console bereaved members and worshipers dealing with the loss of a loved one. Health & Wellness Ministry – Was organized to advise and train Greater St. Mark members to practice better health care for themselves and their families. Health Care Providers – Was organized to provide health care assistance during worship service and advice to St. Mark members and worshipers. Home Department – Was organized to help raise funds for needed expenses. Library Club – Was organized to provide access to biblical resources as well as contemporary resources in various media formats to Greater St. Mark members. Other services provided by the Library Club include: Video Recording of the Church Service and Duplication, Maintaining the Church's Website and Social Media pages, the Greater St. Mark Messaging Service and Live Streaming of our Morning Worship Service on Social Media. Marriage & Family Ministry – Was organized to provide training to answer the needs of and train married couples, and families of children in the ways of Christian living. 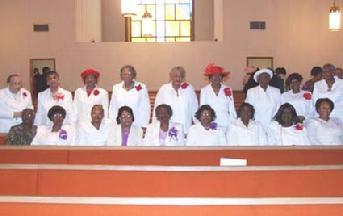 Matrons I – Is a mission group of the church made up of ladies age 30 or over. Matrons II – Is a mission group of the church made up of young ladies between 18 and 30 years of age. Ministers – This is the ministers of the church, who provide spiritual teaching and training to St. Mark members and worshipers. Missionary Society – Is the Women’s Missionary Society formed to provide sisterhood for all women of the church and train them in the mission of the church. Music Ministry – Is composed of all choirs of Greater St. Mark and provides music for Sunday morning worship and other church events. The five choirs: the Childrens’ Choir, the Young Adult Choir, the College Choir, the Greater St. Mark Choir, and the Christian Gentlemen of Distinction. Outreach Ministry – Was organized to reach out to people of the surrounding communities through various activities or events. Pastor’s Aid/Pulpit Study – Was organized to handle the needs of the Pastor. Praise Dance Ministry – Was organized to express worship through interpretive dance. The Praise Dance Ministry consists of the Children’s Praise Dance Team, the Teenage/Young Adult Team, and the Adult Team. Prison Ministry – Was organized to offer assistance and counseling to inmates and convicted persons of the St. Mark community. Public & Intercommunications – Was organized to disseminate event information to Greater St. Mark members and the Public in a timely manner through the use of emerging technology. The Website Ministry falls under this ministry. Recreation Ministry – Was organized to provide recreational activities and outings to children and families of Greater St. Mark. Red Circle – Is a mission group of the church made up of young ladies between 13 and 18 years of age, who meet to study God's word and form a sisterly bond as they carry out the mission of helping others, while learning to be an inspiration to others. Singles Ministry – Was organized to provide support for all un-married members of the church. Sunbeams – Is a mission group of the church, made up of children ages 4 to 12, who meet to study God’s word and how to act like Christian children. Tape Ministry – Is a division of the Library Club and is responsible for video-taping church services or events and providing copies as requested. Tutoring Ministry – Was organized to provide tutoring to school-aged children who are having trouble with a particular subject. Ushers Guild – Handles the collection of offerings, the dispersal of programs, and answers questions or concerns of the congregation during church service. Ushers are called “The Door-keepers” because they guard the doors of the church. Youth Ministry – Handles all aspects of interaction with the youth of the church. This includes Youth Retreats, Vacation Bible School, Youth Explosion, Youth Rally, Youth Sunday, Youth Bible Study, and all youth activities.